Have you ever wished you had someone to turn to who could help you create the life and business you dream of? A trusted mentor who understands that the success of your business is more than the money it generates? Someone who can help remove the obstacles blocking you from achieving your goals and help you transform your current business into the one of your dreams? But imagine what you could do with your own Fairy Godmother. Meet Michelle Spalding, affectionately known as the Fairy Godmother; Michelle is passionate about helping entrepreneurs create a life and business that they love. You’re passionate about what you do and frustrated at the same time with the progress/growth of your business. You’re optimistic that things will get better……but can’t see the path which leads there. You’re tired and wanting more from your business sometimes you wonder if you’re really up for being an entrepreneur. Some days, you’re feeling exhausted, frustrated and on the verge of quitting and you want to scream but fear no one will hear you that can help. Your family and friends miss you and sometimes are resentful of the time you spend with your business. With the wave of her wand, you will learn the strategies you need to increase your income without compromising your values. How to run a successful business and enjoy life and the many freedoms that being an entrepreneur come with. How to spend more time on the things in your business that you love and how to build a team to help you with everything else. Ready for some major transformation in your business? That's the specialty of your Fairy Godmother. Individual coaching will help you reach your business and personal goals faster. You and your Fairy Godmother making things happen, at warp speed. Book a full or half day one-on-one day sessions with Michelle. Magic wand included! Michelle’s effective and proven tips will help your attendees build their businesses, have more free time, and reach their goals. She can help them to magically transform obstacles. ask Michelle to speak at your event or group. As an experienced business veteran, Michelle understands what it takes to create a successful business. But if you’re not finding joy and freedom while pursuing your business goals, is it really success? Of course not. That’s why Michelle focuses on working with women who want it a life and a business they love and aren’t willing to settle for anything less. Enlisting the help of your Fairy Godmother is fun and easy. Michelle offers many services and programs to help you magically transform your business into one that that you truly love. Whatever your goals and dreams are you can rely on Michelle to help you create a realistic action plan to accomplish them and even be there every step of the way. Call on her years of experience to help you remove the obstacles blocking you from reaching your dreams with private coaching, mastermind groups, and workshops tailored to meet your unique business and personal needs. After stalking the Transaction Management Consultants' website for several months and seeing the growth of this company, I decided to pick up the phone and plan a trip from North Carolina to Illinois to meet someone I admired from afar. 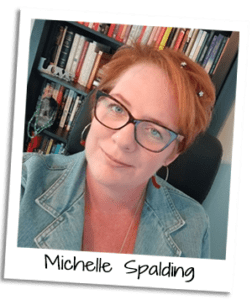 Although we were unable to meet face to face, the first time I talked to Michelle Spalding, I knew she was someone I wanted to know better and someone who could help take my transaction coordination business to the next level. From that day to this day, I have not been disappointed. Michelle Spalding is warm, funny, smart, and innovative. As a business coach, she helped me to think outside of the box and to expand my limited perspective about the transaction coordination business. Week after week, she customized our coaching sessions to address my needs and not her own agenda. Michelle will celebrate your victories and help you develop a strategy to overcome your challenges. Her balanced coaching system made each meeting a pleasure. Thank you Michelle for all you have done to help me grow Transaction Genie. The old Chinese proverb says “When the student is ready the teacher will appear.” I was ready and you appeared! You are a gift to me and everyone who knows you. As a busy Netpreneur and Mother, time is of the Penny Reisessence. Searching for information and people I need to grow my business and give me time to spend with my family was a real challenge! Thanks to Michelle’s program I am loving life! From the very beginning I knew that she had the experience and knowledge to really guide me to make the changes I needed in my business to give me the lifestyle I wanted. Since implementing some of her strategies I have more time and energy for myself, my family and my business. Thanks to my Virtual Fairy Godmother, I’m able to do what I Love! I highly recommend Michelle Spalding for business coaching and consulting. Michelle has extensive coaching skills that identifies weak areas, and celebrates my strengths, and sets an action plan for success. She has made a huge impact on my business by sharing her knowledge. Michelle truly listened to where I was with my business and guided me step-by-step starting from the beginning. I am excited about what my business is becoming as I implement the tools and resources provided to me by Michelle. I had many "ah-ha" moments over the past few months that have given me the confidence to be more of a business owner and entrepreneur as opposed to having a job. Michelle, I can't thank you enough for everything you have done for my business. You are wonderful!! Working with Michelle Spalding has been such a positive experience for me. In fact, I’ve gotten to the point where I don’t even bother to search the internet for what I need, instead, I go right to Michelle! It doesn’t matter what kind of assistance I’m looking for, Michelle listens to my needs, asks intelligent questions, comes up with a plan, and suddenly I’m moving forward in the direction I want, and able to achieve my goals. She is solution-oriented and incredibly efficient which saves me time and enables me to focus on the things I really enjoy doing. When you work with Michelle, you will truly feel as if you have a Fairy Godmother. She swoops in, waves her magic wand, and then everything falls into place in a way that I have always been pleased with. Don’t waste another minute trying to do it all yourself– Forget Google – Call Michelle!! Wow! I have been working with another business coach for a few months and had gained much clarity. My time with Michelle supported and built out all that I had learned so far! Took things to another level. I am so grateful for her depth of expertise and her willingness to share with others. She walks her talk and is to me embodies the ideal of a Shenomenal Woman! I met Michelle when she spoke at one of the training events I was involved with in New Orleans. I was so impressed; I invited her back to speak at a second event. Over the years I've personally seen that she doesn't talk the virtual talk, she truly lives it each day in her business and in the clients she serves.